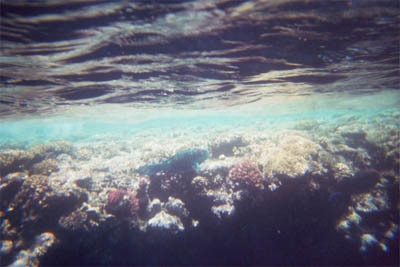 The warm breeze blows in from the Red Sea as I lie on a thin mattress, wrapped in a pale sheet on the sandy beach. BASATA, SIMPLICITY IN Arabic, is about 20 kilometers north of Nuweiba in Sinai, the peninsula south of Israel and Jordan, east of Suez, and across the Red Sea from Saudi Arabia. In the last ten years or so, I’ve traveled to Sinai seven times. Each time, it was to escape, whether from Jerusalem’s bus bombs, Ramadan fatigue in Amman, or just the honking of Cairo’s relentless traffic. To me, the appeal of Sinai is, well, its simplicity. Basata and my previous haunts of Tarabin and Ras al Shaytan are small stretches of beach that border the turquoise colored Red Sea. Rather than the five-star hotels and grand buffets of Sharm al Sheikh and Taba, these beaches are home to bamboo-thatched huts, handmade colorful Bedouin rugs, and those thin mattresses that are meant to be slept on under the stars. Each of these desert-meets-the-sea paradises offers something unique. At Soft Beach in Tarabin, it’s pancakes topped with slices of melon and banana, chocolate nutella, and coconut shavings. Egyptians, Israelis, and assorted internationals travel to Ras al Shaytan to play music together. 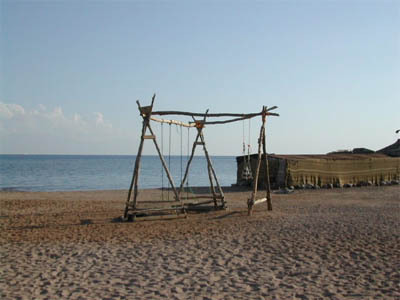 And in simple Basata, the beach’s uniqueness lies in its vegetarian, eco-friendly state of affairs. Basata boasts a small bakery that churns out fresh bread, pastries, and pizza. The camp offers a vegetarian communal dinner ­ alternating each night between a red vegetable sauce over rice and the fried catch of the day. Aside from the veggie food, Basata runs an impressive recycling operation. Guests sort their glass bottles and metal, and there is a separate can for table scraps and other unwanted leftovers that make up the stuff of doggy bags for the local cats. In 2004, al-Qaeda terrorists bombed Ras al Shaytan’s peaceful huts. Sadly, there were major terrorist attacks in Sinai each of the last three years. The Taba Hilton, located along the border with Israel, was bombed at the same time in 2004. Militants attacked Sharm al Sheikh in 2005, and Dahab ­ another Sinai beach ­ in 2006. All told, close to 150 people were killed in these attacks with hundreds more wounded. Still, on Friday night at the border, Israelis speaking Hebrew, Russian, and Arabic fill the terminal, many headed for the Taba Hilton’s casino for the night, similar to a Tijuana night out. Sinai is a place to get away, not just for Israelis looking to gamble, but for middle class Cairenes too; Basata was full of young Egyptians away for the weekend. Europeans fly down for long weekends, especially to the resorts of Sharm al Sheikh. Amid these travelers, the mostly poor, local Bedouin population lives off of the tourism industry, but also by commerce and smuggling. Sinai doesn’t have urban areas with the trappings of government buildings and courthouses, town squares, or central parks. Despite an increasing number of security stations and checkpoints that are charged with protecting tourists, Sinai remains a potential target for those who want to commit an attack. So, if that is the case, why risk a trip to Sinai? Well, it is a wonderful place. While terror attacks are attention-grabbing events that make the news; they aren’t a common killer. For 2006, the U.S. Transportation Research Board projected that 43,300 people died in traffic accidents on U.S. roads! Driving your car is more dangerous than visiting paradise. Trips to Sinai aren’t about stress and terror, but rather swimming and snorkeling in the Red Sea and then retreating to covered bamboo shelters to read, nap, and play backgammon. A couple of visits ago, while snorkeling amid the greenish yellow coral, I came across a school of inch-long orangish red fish. There were thousands of them, and they swam so close together that they appeared to be a giant Chinese New Year’s banner being pulled through the water. On my last trip, I swam with some long, pencil thin, sky-blue fish that hovered close to the surface and pretended to be baby sharks. Also worth mentioning was the little black fish with a silver dot that stalked me and bit my calf. It was the closest I came to anti-Americanism the whole weekend. More noteworthy than anti-American fish, are Basata’s stillness and beauty. Evenings here are clear, and as the sun retires and the fading light bounces off of the aqua sea, the Saudi hills turn reddish brown. After dark, the night grows congested with constellations. Shooting stars tail across the field to the sounds of dried bamboo roofing rustling against the wind. Tonight, lying in my hut, the stars are only a first act, as a giant orange half-moon just rose over the Saudi coastal lights. It sits low on the horizon, almost bobbing on top of the sea, before rising into the brightening night sky. If you are going, Basata takes reservations and the English speaking staff can be reached at www.basata.com. If you are looking to love the nature but to sleep indoors, the Movenpick in Sharm al Sheikh is quality place and a good launching point for trips to Ras Mohammed, the fantastic Egyptian national park that is home to world-class diving and 2 million year old fossil reefs. On the border with Israel, there is the Taba Heights complex and The Taba Hilton; both are higher end places with diving centers and casinos. Matador is a community of engaged travelers who care about social justice. Join us today.